As the entire world no doubt is aware a new savior has arisen on the horizon. 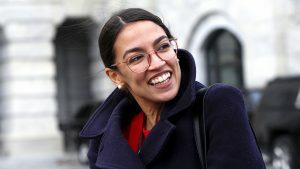 Since winning election to Congress Alexandria Ocasio Cortez has enlightened us with her wisdom, eloquence and supernatural legislative ability. Because I want to acknowledge the present and future leader of the Democratic Socialist party of America I now present the full text of her breathtakingly beautiful and practical “Green New Deal.” This Green New Deal presents the “Sense of Congress” and as such it is our duty to obey. human activity is the dominant cause of observed climate change over the past century; As for the unobserved climate change since it is unobserved we cannot blame it on humans. Perhaps if we had been observing the unobserved climate change we could but hey, that’s the breaks. Unobserved climate change sounds rather spooky. Maybe Scooby Doo and his gang can find out who the culprit is. a changing climate is causing sea levels to rise and an increase in wildfires, severe storms, droughts, and other extreme weather events that threaten human life, healthy communities, and critical infrastructure. I know the moon causes sea levels to rise and fall. The common folk call this phenomenon “tides” but we know wealthy white folk are responsible. mass migration from the regions most affected by climate change; And we don’t want mass migration. Unless it’s caravans from Central America coming to the Southern border of the United States. wildfires that, by 2050, will annually burn at least twice as much forest area in the western United States than was typically burned by wildfires in the years preceding 2019; Wildfire. I always liked that song. She comes down from Yellow Mountain/On a dark, flat land she rides/On a pony she named Wildfire…..oh oh oh Wildfire….wil-yile-yile-yild fire! a risk of damage to $1,000,000,000,000 of public infrastructure and coastal real estate in the United States; I know I’m throwing up a lot of numbers here and I apologize for that. But the white man likes numbers. They feed his toxic masculinity. When the peoples of color take over the world we shall ban math and numbers and replace them with yoga! Tomorrow: Part Two (May Alexandria Ocasio Cortez be forever blessed).